How do you top a classic? Because that’s what the original MEZE 99 Classics are – both in name, and in experience, a genuinely brilliant pair of headphones that we previously awarded Editor’s Choice. If you’re Antonio Meze, you don’t – at least, not immediately. What you do is release a budget version that packs in (almost) all the goodness of the original – the 99 Neos. In this review, we break down their design, comfort and fit, sound, packaging and accessories, specs and more, as well as how they compare to other models. You can also check out our video review. The most obvious question about the MEZE 99 Neos is: how do they compare to the original? They are so similar in form and function that it’s worth highlighting the differences and similarities between the Neos and the 99 Classics (full review here) before we go any further. They look virtually identical, with the same stellar design that made us fall in love with the Classics. There’s the prominent metal band with its classy MEZE logo on either side, as well as a suspended leather headband underneath it. The pads are the same memory foam on both models. They are virtually identical in terms of spec, with the main differences being in impedance - the Neos are 26 ohms while the Classics are 32, making the latter just a touch harder to power – and in construction. For while the Classics had housings that were sheathed in absolutely gorgeous walnut wood, the Neos are made of tough, rigid plastic. And herein lies our first problem. The design may be virtually identical, but there’s no denying that the plastic just isn’t as cool as the wood – and, as we will explain momentarily, doesn’t do amazing things for the sound, either. Beyond that, there’s very little to write about the design that we didn’t cover in our review of the Classics. It’s still very, very good, eye-catching enough to make people ask where you got them (the headphones are from Romania, in case you were wondering) while still retaining a level of functionality the lesser headphones just can’t match. We still absolutely love the almost spiderlike design of the metal band, and we love the tiny details, like the embossed headphone name on the lower band. Like the Classics, the Neos have twin recessed ports in each housing, to allow you to attach the included cable. The company includes a one-year warranty, and in addition, the parts – including cables, headband, and pads – are entirely replaceable, meaning you can swap them out if anything gets damaged without having to send the headphones in for repair, or if you get out of warranty. Even with the plastic, these are still among the best-looking cans on the planet. Compare them with the Bowers & Wilkins P7 Wireless (full review here). Although those have been supplanted by the excellent PX model, they are still widely available, and still one of the best examples of great headphone design out there. However, there is a certain brutalist feel to them, a certain corporate toughness, that might turn some people off. The Neos were very clearly made by and for human beings, and it shows just how good MEZE are at design. One thing that definitely hasn’t changed – and that we are very happy to see remain the same – is the absolutely fantastic comfort and fit. The 99 Neos are an absolute blast to wear – just like the Classics were. They are of an identical weight (9.2oz without cables), and are light enough to happily wear for hours on end. We absolutely love the suspended headband concept, where a flexible band is held by elastics underneath a more rigid one that holds the cups and housing, and we do wonder why more Manufacturers don’t use it. The only headphones that we can think of that did, recently, were the excellent AudioQuest Nighthawk Carbons (full review here). It really does work stupendously well, and is very comfortable, even for long periods. The memory foam earcups are unchanged, and do an excellent job at both providing isolation and being comfortable to wear. They are big enough to accommodate all but the largest ears, and there shouldn’t be any issue getting a good fit with these. Once again, we are forced to compare these to the 99 Classics. Something we have learned since we started writing this review: it’s impossible to avoid. Sorry. The sound of the Classics was life-changing. You know how sometimes mass-market headphones like Beats By Dre and Skullcandy massively overcook the bass, bumping up the low-end at the expense of everything else? What they do reminds us of a chef getting a real hard on for something like black truffles, and shoving crap-tons of them into every dish that goes through his kitchen, regardless of what the finished product tastes like. Well, MEZE have a few truffles of their own, and they know what to do with them. The sound of the Classics was a mix of warm, rich bass, engaging mids, detailed highs, and an absolutely terrific soundstage – one of the most wonderful sound signatures we’d ever come across. It was never going to compete with ultra high-end gear, but for three hundred smackers, it was just stupendous. The sound of the Neos is the same…only not quite as good. Take in terms of the overall project, that’s understandable. After all, the goal is to offer a budget version of the Classics, and what’s implied there is that the audio quality isn’t going to be quite as refined. So what you get here is the Classics’ sound signature, without the rough edges sanded off. The wood in the older headphone model really helped, creating a wonderful resonance that really showed the music in the best light. Plastic, however rigid or well-made it is, just isn’t going to be the same. Don’t get us wrong: it’s not that the sound is bad. Far from it. The tuning is still there, as is the audio expertise, and listening to music on these is a pleasure. Put a genre like soul through here, or hip-hop, and you’re still in line for one of the best rides in audio. Gooey baselines, thumping drums, and mindblowing vocals are all part of the package. Again, we need to emphasise the outside of the slightly decreased impedance, the specifications for the Classics and Neos are the same, down to an identical frequency graph. Both have a set of 40mm drivers, and the sound is very similar between the two of them. While A/B-testing the two headphones together definitely showed that the Classics are superior, the differences between the two were pretty minimal. And both are much more engaging than the far more storied Sennheiser HD600s – we realise that we might be risking the wrath of the audiophile headphones crowd here, but while the HD600 is technically a better pair of headphones, and offers more precise representation of the music, there’s no question about which pair is more fun. Another key difference between the two models: the accessories. With the Classics, you got two cables – a long one, for static listening, and a shorter one with in-line controls for use on the move. You also got a 6.3mm adapter, as well as a two-pronged airline adapter. With the Neos, that second adapter is gone, as is the longer cable. 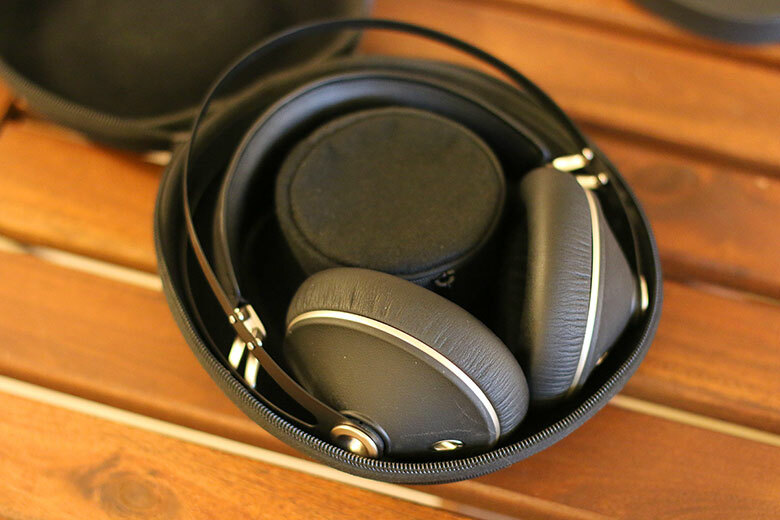 What you do get in both models is the wonderful carry case for the cables and adapters – a design that makes us think of the container that came with the Master & Dynamic MW50s (full review here), and which works very well indeed. You also get the same carry case, albeit in quite a different material, which is more textured for the Neos. The accessories here are excellent, and it’s something that the company has always done a very good job in. However, as you are about to see, if this is what accounts for the price difference, then it’s a slightly weird decision. Here’s the biggest problem we have with the 99 Neos. On the one hand, we absolutely respect the goal here, which is to provide a cheaper, more accessible version of the 99 Classics. At a time when audio gear is getting more and more expensive, budget options of already excellent products are always welcome. We applaud that, and want it to continue. The issue is, for that to work, the budget gear has got to cost significantly less than the original, and that’s just not the case here. The brilliant, extraordinary, mind-blowing 99 Classics cost, at the time of writing, $309, both on Amazon and direct. The 99 Neos cost…$249. A $60 difference. That’s it. Now, we know that for quite a lot of people in the US these days, that’s a reasonable amount of money, and nothing to sniff at. But if you’re at the stage where you’re trying to decide whether or not to buy a three-figure pair of headphones, we’d submit that the extra $60 isn’t going to be a massive problem for you. If the Neos cost $100 less, for example, then we can absolutely get behind them, as a way to open up the market to those who haven’t been able to experience what the company can offer. But the price points between the two models are just way, way too close. In that context, it’s very difficult for us to recommend you buy these. You have no idea what that’s doing to our brains right now. What we have here is an excellent pair of headphones that delivers a stellar experience, and we’re telling you not to buy them. That’s upending the established order of things, to put it mildly. But really, what choice do we have? Where the Neos are good, the Classics are great. They are a markedly superior product, and offer a superior experience, for not all that much more. If the Neos were slightly less expensive, then they would get a wholehearted endorsement from us. As it is, we struggle to figure out what MEZE were thinking here. Why offer a slightly-less-good version of a product for not all that much less than the original? If there’s a sudden shortage of 99 Classics, or a run on walnut wood, then these would make an excellent choice, and you should absolutely buy them. Until then? Nah. Sure, you might think that you don’t need the airplane adapter, the extra cable, the slightly cooler case. You can get by without the wood. The impedance difference doesn’t bother you. But for $60, who cares? Just buy the damn Classics, and thank us later. Buying them makes absolutely no sense whatsoever. As this entire review has been a more or less direct comparison with the 99 Classics, let’s provide three different alternatives here. These don’t look or feel nearly as good as the Classics, or the Neos. Their sound signature isn’t nearly as fun. But it’s hard to argue with their history, or how beloved they are by just about everyone listens to them. Their open-back design provides an effortlessly revealing sound signature, making them ideal for those who value truth in their music. They are slightly more expensive than the 99 Neos, but cheaper than the Classics. However, we’ve seen the price fluctuate, so don’t be afraid to shop around. Another landmark headphone – even though it’s quite a bit more expensive than the MEZE offerings. OPPO’s planar magnetic cans made waves when they were released, offering groundbreaking technology for a very reasonable price, and they’ve stood up well. Aaron Fournier’s On-2 headphones are just wonderful. They are on-ear, as opposed to the 99 Neos’ over-ear, but they have the same excellent design, with wooden cups and a decent indie vibe. They are fully portable, too, hinging to take up less space. The sound isn’t quite as robust or enjoyable, but for the price you pay, these are absolutely excellent. We strongly recommend checking them out if you want something a little bit sleeker than the Neos. Read our in-depth review. Want Even More Master Switch? Sign Up For Our Weekly Newsletter! A simple DAC upgrade can do wonders for your audio playback, as for example, a 4K-capable TV might change your movie viewing experience. So why not take the jump? We’ve gathered some of the most exciting converters currently on the market. Remember the very first iPod from seventeen years ago? No? Damn, we're old. Anyway, it sold around three hundred and sixty million units. It changed the way we listen to music forever - and today, Apple is no longer the market leader. Wireless headphones are officially in our good books. It's been a long time since the days where wired headphones could claim superiority - the sound quality, useability and style have more than caught up. Exquisite. That’s the word that came to mind when we first pulled the Romanian-made MEZE 99 Classics out of their carrier case. It’s not a reaction that most audio equipment inspires, and definitely not a reaction inspired by most headphones.